Through systematic observation and deductive reasoning, the group should be able to define an equation that is valid for any convex polyhedron (Euler’s formula). 1. 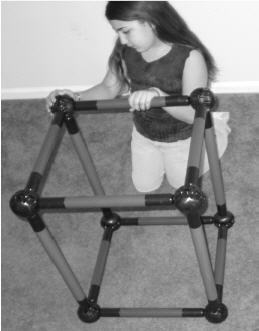 Teachers should build two Toobeez models, one of a polyhedron and one of a polygon. 2. As a class, the students should be asked to recall the definition of a polyhedron and to highlight its unique properties. Teacher Note: It is a good idea to construct a Toobeez model of a polygon and ask the class to distinguish between the two types of figures. 3. After reviewing the definition of a polyhedron, lead the class in a review of the nomenclature of polyhedra. Teacher Note: Activity #7 provides an excellent introduction to this topic. 4. In addition to the number of faces, point out to students that a polyhedron can also be described by the nature of its angles. Teacher Note: Point out that it is easy to visually distinguish the two types of polyhedra by examining the angles. If the legs of an angle appear to face outward from the figure’s center, the polyhedron is concave. 5. Inform the class that today’s lesson will focus on convex polyhedra. 6. On a blank page in their notebooks, instruct students to draw a table with four columns. The four headings for these columns are: Name of Polyhedron, Faces, Edges and Vertices. 1. Divide the students into groups. Challenge: Through systematic observation and deductive reasoning, the group should be able to define an equation that is valid for any convex polyhedron (Euler’s formula). 3. Using Toobeez, groups should be directed to build four different types of convex polyhedra. Teacher Note: Stress that the polyhedron must be convex and fulfill the definition of a polyhedron. 4. After building each model, the group should observe and record the number of faces, edges and vertices on the table in their notebooks. 5. Using the number of faces and previous knowledge of polyhedron nomenclature, students should name the figure. 6. After the data are collected, each group should begin a discussion to determine the mathematical relationship between the three variables observed: faces, edges and vertices. 7. This discussion should continue until the students arrive at a pattern that governs each example observed. Teacher Note: Even if the pattern is quickly found by some, allow all groups adequate time to arrive at their own conclusions. 8. Once the pattern is observed by most groups, write Euler’s formula on the board: Faces + Vertices = Edges + 2. 10. Finally, move to the “Activity Discussion and Processing” section of the activity. What is the relationship established by Euler’s formula between the number of faces, edges and vertices found in a convex polyhedron? How can the relationship established in Euler’s formula be used in everyday situations? How does Euler’s formula enhance mathematical communication? Challenge groups to build a concave polyhedron with Toobeez. After recording the required data, demonstrate that Euler’s formula does not apply. Teacher Note: If time does not permit building a model, have students carefully draw a concave polyhedron for homework on graph paper and conduct the same analysis. Have the students refer to their textbooks or a provided formula list and calculate the volume for various polyhedron models.